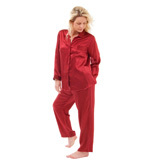 100% pure silk nightshirt. Mid thigh length with three quarter length sleeves and five covered buttons down the front. The collar, cuffs and front facing seams are finished in pale pink piping on the ivory and matching piping on the black, cream and burgundy.